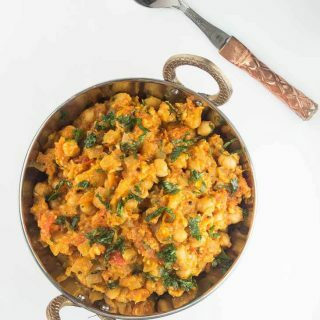 This easy Chole Masala recipe consists of chickpeas and tomatoes simmered with a mixture of ginger, garlic, jalapenos, onions, and Indian Spices! It's my clean, healthy, and delicious perfected version of a popular North Indian dish! Heat the cooking oil in a large non-stick pot or pan on medium heat. Add the black mustard seeds and let them fry for 20-30 seconds. Mix in the garlic, ginger, onion, and jalapenos (if using) and saute until the onions start to become translucent, mixing frequently. Mix in the chopped tomatoes, roasted cumin, turmeric, and salt. Cover and cook until the tomatoes soften (5-10 minutes), mixing frequently. Mix in the cooked chickpeas, ground cumin, sugar, garam masala, and lemon juice. Cover and allow everything to cook together for another 5-10 minutes until the chickpeas soften and absorb the flavors. Mix frequently. Open the cover, and mash about half the chickpeas using a masher (or your fork). Mix and allow the chole to cook, uncovered on medium heat, until the dish slightly reduces (the water evaporates and the dish thickens). Add in the freshly chopped cilantro and mix once more. Turn off the heat. Serve hot with some cooked rice, quinoa, tortilla, roti, or naan. Garnish with some raw onions, jalapenos, and a squeeze of lemon juice if desired. There are many different types of garam masala (i.e. some are stronger than others). Some are store bought and some are made at home, so depending on the flavor and how sweet your tomatoes are, you may need to adjust the amount of salt, lemon juice, sugar, and garam masala at the end. I like to use a combination of roasted ground cumin and garam masala because I love the flavor of the roasted cumin in this dish. But you can also sub out the roasted ground cumin for garam masala. For kids/toddlers, omit the jalapenos if they can't handle heat. Also, depending on the type of garam masala, some are stronger than others and spicy, so you can sub it out for roasted ground cumin if you prefer.